Mice and rats are for people who would like to have a pet that won’t upset their lifestyle too much. If you’re not interested in animals that attack posties, bring home dead birds, make enough noise to wake the dead, shed hair all over the place and cost an arm and a leg to buy, feed and house, consider a mouse or rat. They’re also ideal for children who still aren’t quite ready for any of those other pets. Intelligent, social and gentle, these small rodents cost very little to buy and are easy to maintain. And because of their relatively short life span (normally one to two years for mice and two to three years for rats), they don’t require a lengthy commitment. But that doesn’t mean you won’t grow attached to them. Rats, in particular, are very inquisitive and have quite strong personalities. Housing – Although the habitat shown below looks functional and extremely economical, it’s not the way to go. Both mice and rats are inveterate escape artists. (Interesting side note: once free, most mice will stay on the run, however, rats often return to their cage.) To take no chances, your rodent residence should be made of materials strong enough to resist those gnawing teeth. We suggest metal or heavy-duty plastic cages free of any coatings of possibly toxic paint. Lids and/or doors should be tight fitting, the floor must be solid. Because these animals cannot shed heat well, their cages require good ventilation. This should rule out glass aquariums. While the sheer sides will keep mice and rats from climbing the walls, the enclosed area can become very hot and humid. To enhance your pets’ existence, get the largest cage you can handle, preferably one with multiple levels. This way you can turn an upper level into a designated bedroom complete with a flowerpot or empty coconut shell to retreat to. The rumpus room below can be furnished with food and water containers and assorted items to play with. Bedding. Many people provide wood chips for their mice and rats to snuggle into. Just be sure not to use scented varieties like cedar and pine. They emit aromatic hydrocarbons that can lead to respiratory diseases. You can also use either paper-based or lucerne-based cat litters. As long as it’s absorbent, non-toxic and dust-free (that rules out sawdust), and you change it two to three times every week. Playthings. One of the most endearing traits about mice and rats is their utter lack of pretension when it comes to toys. Forget Fisher-Price and Mattel. Instead, throw in a few toilet rolls or plastic margarine containers or visit the hardware store for some PCV pipes and connectors. They’ll be overjoyed. Of course, if this offends your sense of style, pet shops sell all manner of wheels, tunnels and other more sophisticated devices. 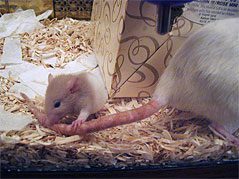 Feeding – Just because mice and rats are omnivores and will eat almost anything (even Mum’s tail) doesn’t mean you should let them. The easiest and most reliable way to ensure they get a properly balanced diet is to feed them commercial rodent pellets. To add a bit of variety, you can supplement meals with pasture hay or straw, grains, cereals, plain biscuits, bread soaked in water, mixed bird seed, nuts, well-washed fruits and vegetables. Not only does the hay serve as an excellent source of fibre for healthier intestines, your pets will love to play in it and use it to build nests. Like all of us, mice and rats enjoy special gastronomic treats. However, their idea of a treat might vary somewhat from yours. They love fresh grasshoppers, crickets and cockroaches. Keeping your pets’ teeth strong and healthy is as easy as adding a raw rib or shank bone or piece of hardwood for them to gnaw on. Water. You should make sure that clean, fresh water is always available. If you use a bottle with slipper tubes, you should regularly check that the tubes haven’t become blocked with dirt. Behaviour and care. – As long as you handle your mice or rats gently and give them frequent attention, they will soon become affectionate companions. Of the two, rats seem more intelligent and receptive to handling, while mice get more enjoyment from toys and exercise equipment. Rats are also tidier and much less smelly than mice, even knowing enough to keep their beds clean and often learning to use a specific area as their toilet. You may notice a red stain around your pet’s face. Don’t be concerned, both rats and mice have an Harderian gland which produces reddish tears and nasal secretions. 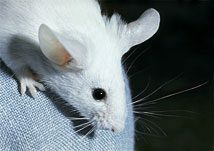 Breeding.While mice and rats both fall into the category of prolific breeders, mice can produce twice the offspring of rats. In theory, one female mouse could mother more than 30,000 pups in one year! 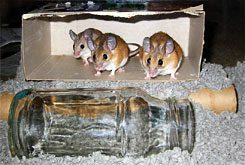 While litter sizes average a modest enough 10 to 12 young, mice start breeding from six to eight weeks of age, and pregnancies last only 19 to 21 days. 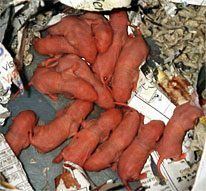 Rats don’t start breeding until they’re two to three months old, pregnancies last an average of 21 days and litters number six to 12 pups. However, the female rat (doe) will be fertile again within 24 hours of giving birth. Needless to say, you should consider some forms of birth control unless you want your place overrun with rodents. You could start by buying only females. You could have us desex your males. Or you could consider segregating males and females. But you should know that while male rats are quite tolerant of each other, male mice will invariably fight if housed together. One last comment about their care. Like any animal confined to a cage, mice and rats are completely reliant on their owners. Unfortunately, unlike many other animals, they can’t bark, meow or similarly let you know they’re hungry. While a busy lifestyle might have been a reason for getting mice or rats in the first place, they are still a responsibility. Don’t forget them. Diseases – Tumours, bowel disease, pneumonia and skin infections are the most common serious ailments afflicting mice and rats. 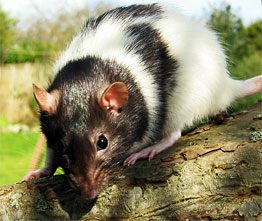 Respiratory diseases, especially mycoplasmosis, and various intestinal diseases are also common with rats. In most cases all these illnesses result from poor housing or maintenance. For instance, mycoplasmosis tends to be found in cages with high ammonia levels, and ammonia comes from stale urine. The very first thing to do when you discover an ailing mouse or rat is separate those affected from the others and keep an eye on them. Meanwhile, thoroughly clean the cage and utensils. If the problem persists, bring the sick animals to us. We look forward to a change of pace from those more commonplace pets alluded to in the first paragraph.